Too many people worry about how they look in the mirror and don't pay enough attention to their performance. Learn how to train for aesthetics and strength. Siege, I&apos;m going to be honest: I&apos;m in the gym to carve a six-pack. But I was wondering if it&apos;s possible to look good and be strong. You seem like the right guy to ask. I know all about you, bro. You&apos;re in the gym for one thing, and one thing only: aesthetics. 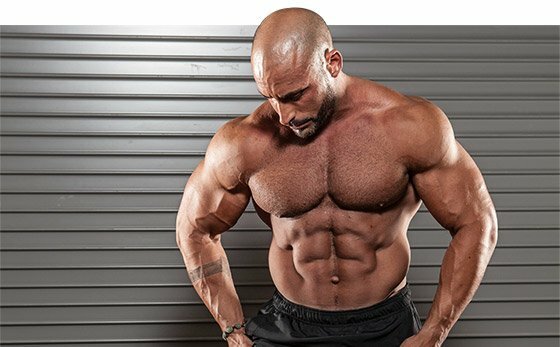 Forget about eating, sleeping, or drinking—if you don&apos;t have that coveted V-taper, you might as well pack it in because your life has lost all meaning. Oh, I get it, aesthetics are the new "big." Nobody talks about how big guys are anymore; it&apos;s all about, "Oh, damn, that guy&apos;s aesthetic as hell!" Well, that&apos;s nice and all, but pretty little guys have to learn how to look good and be strong. That&apos;s the new rule of fitness. I&apos;m calling it "strengthetics." Yeah, you can walk around with a good physique and leave everybody &apos;mirin, but if you don&apos;t have any go with your show, strong people are going to call you out on it... or laugh at your weak lifts. Prepare yourself for more articles on this subject—it&apos;s dear to my heart. Today, we&apos;re going to concentrate on your core. A six-pack is a matter of diet; a strong, healthy core is a matter of training. Here&apos;s what you need to know. A lot of guys like the thought of having a tiny waist and carved six-pack. Shoulder-to-waist ratio is like Hollywood magic—the bigger the ratio the better you look. Abs training, however, doesn&apos;t work how you think it does. If you spend half an hour at the end of every workout doing crunches and can&apos;t figure out why your belly isn&apos;t looking any better, I&apos;ve got some new rules for you to follow. You&apos;re never going to do another sit-up or crunch again. One of the biggest problems in society is caused by everyone sitting on their asses so much. This sedentary lifestyle makes the hip flexors shorter and the pelvic tilt more pronounced—that&apos;s why back problems are so common. Crunches and sit-ups just add to the stress in your back, so stop doing them! "Crunches and sit-ups just add to the stress in your back, so stop doing them!" Do you seriously think that your body evolved the way it has so that you could lay down on the floor, curl up into a fetal position, and somehow grow yourself a six-pack? Your abs were built to stabilize your body through isometric, eccentric, concentric, and rotational contraction in an upright position. Stop lying down on the job. If you want a six-pack that&apos;s actually strong, you need to do standing compound movements like standing presses, squats, front squats, and deadlifts. When you do compound exercises, you train your entire core, along with the other muscles you activate doing those lifts. That means you don&apos;t have to do any extra abdominal work. It&apos;s built in to your workout. Instead of doing all your shoulder presses seated, stand up and engage your abdominals, lumbar, and a whole mess of other muscles! Doubt that you can work your abs doing presses? Then try a heavy front squat. Unrack the barbell and tell me you can&apos;t feel your abs engage. If you&apos;re not getting enough compound action in your program, add the exercises below to your workouts a couple times per week. These movements will keep your core nice and tight without making your waist overly wide, and without affecting the hip flexors. We want to keep our midsection slim and trim, so keep that volume down and your strength up! These can be done from three different positions: low, middle, and high. I suggest a mixture of all three. If you do it from the top, the movement should mimic a sledgehammer swing. Put the cable at the midpoint and make sure your feet are wide so you only engage your upper body. A top-to-bottom cable twist should mimic a bad golf swing. Each of these variations provides rotational, concentric abdominal work which engages your entire midsection, including the obliques. Make the movement fast and powerful. Go for speed. This is full-body movement requires energy generated from the core. Raise a medicine ball above your head with both arms and throw it down as hard as you can. Pick it up and repeat until you are fully exhausted. During each training session, your goal should be to increase the time you can hold a plank position. Have a partner assist you once you can hold a plank for more than 20 seconds; have your partner push you down or place weight on your back. I like the ab wheel because it can be scaled to skill level. Start on your knees so you can limit the amount of extension. The extension portion should be slow and controlled. As your strength increases, try doing them from a standing position. Depending on your skill level, you can do other forms of eccentric work. An advanced athlete could perform dragon flags, but a beginner probably should start by perfecting the ab roll-out and progress from there.